I’ve been meaning to try Chilantro and every time I see a tweet from them announcing their location (they rotate locations), I salivate in yearning. Alan who has no idea I’ve been stalking Chilantro by way of twitter, asked me while we were out drinking downtown last weekend, “How do you feel about trailer Korean food?” I shrieked, “you mean, CHILANTRO?” Fool’s been haunting this place and I had no idea! So the boyfriend took me and I sampled three different tacos. I will share my thoughts further later (am a big fan) but just wanted to post this since it’s time sensitive. 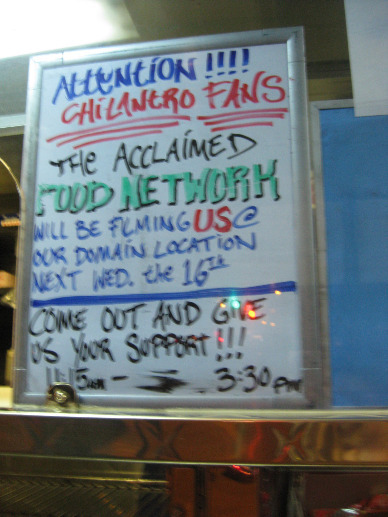 Food Network Is Filming Chilantro at the Domain today from 11:15am to 3:30pm. I’m working but if you can go, let me live vicariously through you. Report back! I leave with several pictures I took last weekend.